It rained all week here. Thank God. Sometimes I feel like I live in a terrarium: there is no weather in San Diego. As a New Englander, it's nice sometimes to experience rain, sleet, cold, you know, weather. This was obvious to me when it rained every day last week, the first time that has happened in over a year. Standing at my window with my cup of coffee in hand, I watched the dark clouds roll in. Like something in a brown bear that just knows it's time to hibernate, something in me knew it was time to make scones. I could have been on a Discovery Channel program: The camera peers in on me; I'm exiting the pantry closet, arms weighed down by flour, sugar, chocolate chips, and whatever else I could put into a baked good. A Bear Grylls-like voice over says, "See here as the young woman sensing the imminent rain cannot suppress her instinct to make scones." As the rain fell, I instinctively added banana, espresso, and chocolate chips to my scones. I could not say why, I just knew it was the right thing to do. With a high butter content and ripe mashed bananas, their texture is moist yet flaky and not too crumbly. And the flavor is sweet yet bold like a chocolate biscotti dunked in a caffe macchiato. It's sunny here again. But I've made enough scones to last all winter. I'll just sit here and rest until I see clouds again on the horizon. 1. Preheat oven to 400 degrees F. Place oven racks in top and bottom thirds of the oven. Line two large baking sheets with parchment paper. 2. In a small bowl, whisk cream and egg; set aside. 3. In a large bowl, mix dry ingredients: flour, sugar, baking powder, baking soda, salt, espresso powder, and cinnamon. Add chilled butter, and mix with a pastry blender or fork until a coarse meal forms with tiny pea-sized butter pieces. Mix in bananas and chocolate chips. Add the cream mixture to the flour mixture and, using a spoon, mix until just combined. Do not over mix, or the dough will become leaden. 4. Turn out dough onto a lightly floured surface and shape into a disk, about 1/2-inch thick. With a wet knife (to make slicing easier) cut the dough into 6 large triangles (or 8 smaller ones). Place scones on parchment paper-lined baking sheets. 5. Brush egg wash over the tops of the scones. Bake scones for 20-22 minutes, rotating pans mid-way through. Bake until puffed and golden; transfer to a rack to cool. Your scones look incredible! I can't wait to try this recipe. I loved this post Susan. The scones are so homey and comforting too. Those are unique sounding scones! They look fantastic! I wish I would've read this before breakfast...there's always tomorrow. Rain is the perfect excuse to just stay in and cook. It was raining all week too here in LA. Why is it that scones and other comfort (read: high fat) foods taste better when it's nasty outside? Anytime you feel the need for weather, my friend, you just haul yourself up to Minneapolis. I will welcome you and your scones with lots of Weather Advisories. It's like you saw what I ate for breakfast everyday and baked it. Love it. All my favourite in this scone. Must be very delicious. I really am not a (good) baker.... but this one I am going to try ASAP. It sounds and looks so delish that its worth the try. Greetings from New England (while watching the JETS). These scones contain everything that I love. Can't wait to make them! foodiegurl0-You don't need to be a baker to make these scones. I promise. Sorry about the Jets. Looks like Peyton did it again. antionetta-I'm happy to hear it! Wow- sounds like an amazingly indulgent and yummy scone recipe! They look fantastic and mouthwatering. I really cant wait to try it. You are too funny, with your brown bear hibernation analogy! :) These sound wonderful. I bet they would be fantastic, warmed up, a little bit of sweet butter, with a double shot... great way to start the day! Those sound fantastic. Don't you worry the rain should be back tomorrow... at least it will be in Orange County. Now that's a fun read! Bananas in a scone ... sounds brilliant ... haven't made scones for a while ... no rain in sight ... maybe don't need rain, maybe just need banana scones! Wow! really taste. I like this post. Thanks for share. 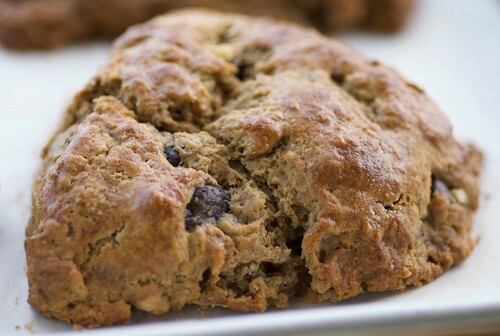 Banana, coffee and chocolate in a scone, you just trebled the stakes in the yummy department! Oh that scone looks and sounds terrific. Over the top good! I live in Virginia and originally I'm from Long Island and I cannot imagine missing rain, sleet or snow or cold weather....I think I would love where you live!!!! I never really understood what all the fuss was about with scones until I tried this recipe. I don't know what it is about banana and coffee in baked goods,it's such a delicious flavor combination even though it sounds like it would taste really strange. Thanks so much for posting this recipe! So that's how you make scones. These look good! These were the best scones I ever had. Very Good! It was crazy sticky messy but the end result was perfect. This recipe is a keeper, thanks for sharing!